No sooner had the referee blown the final whistle than the parties started on the streets of Vanuatu, despite their 3-2 defeat to Mexico. Kava, a traditional celebratory drink in the South Pacific, made of the roots of the eponymous plant, flowed as it would on the biggest of occasions. The fact that Vanuatu had zero points in Group A at the FIFA U-20 World Cup Korea Republic 2017 was irrelevant. The nation’s debut at the tournament had been an historic moment. “Kava is our national drink for celebrating and having a good time together,” said Bong Kalo, Vanuatu captain and hero to his own team-mates. The No. 10 is a student and, like the other 20 members of the Vanuatu squad, he is not a professional footballer, but he is one of only two players among his compatriots with experience of playing in the OFC Champions League. Centre-back Jason Thomas is the other and he is also the only other player to have represented his country – an island with fewer than 300,000 inhabitants – at senior level. Most of the population earn a living through horticulture, and some of the players also help out their families with the work. 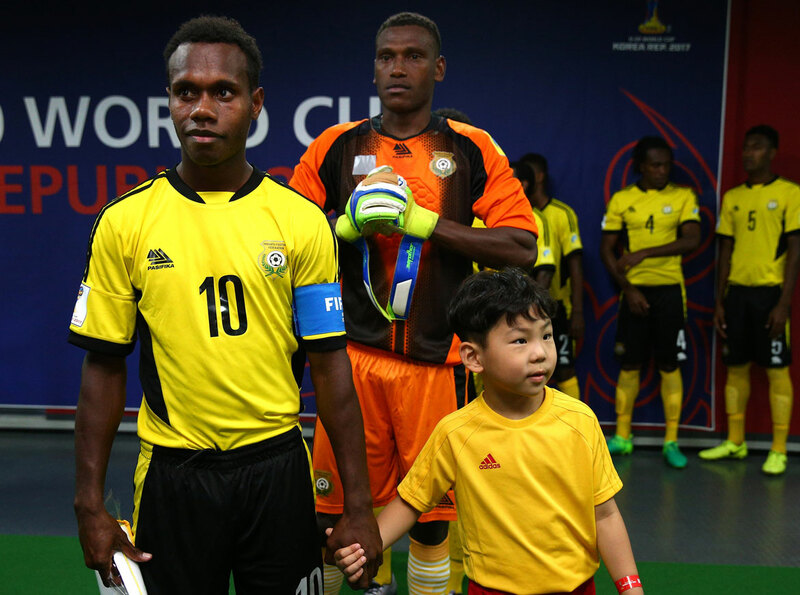 “I’m proud to be their captain at a World Cup,” said Kalo, who scored Vanuatu’s first goal at the tournament, a stunning strike that showcased his ability and killer instinct. The islanders equalised through another superb goal, this time from Ronaldo Wilkins, only for Mexico to net the winner in the fourth minute of stoppage time at the end of the game. “It’s true that we lost, but I’m happy with the way we all played,” Kalo continued. At that last comment, he opened his eyes wide and let out a hearty laugh at his own audacity. Could Vanuatu win their next two games? Kalo sees no reason why not. For Kalo, taking something back from a World Cup is not only about experience, winning a game or gaining the knowledge that certain Korean foods are a lot spicier than his palate is used to, being accustomed to fish, fruits and vegetables. Instead, he is eager to show what he can do in order to earn a move from lifelong club Tafea FC to a stronger league. If Kalo can repeat his efforts from the Mexico game against Venezuela on Tuesday and against Germany on Friday, doors could well open for him. And of course, there would be kava for everyone.